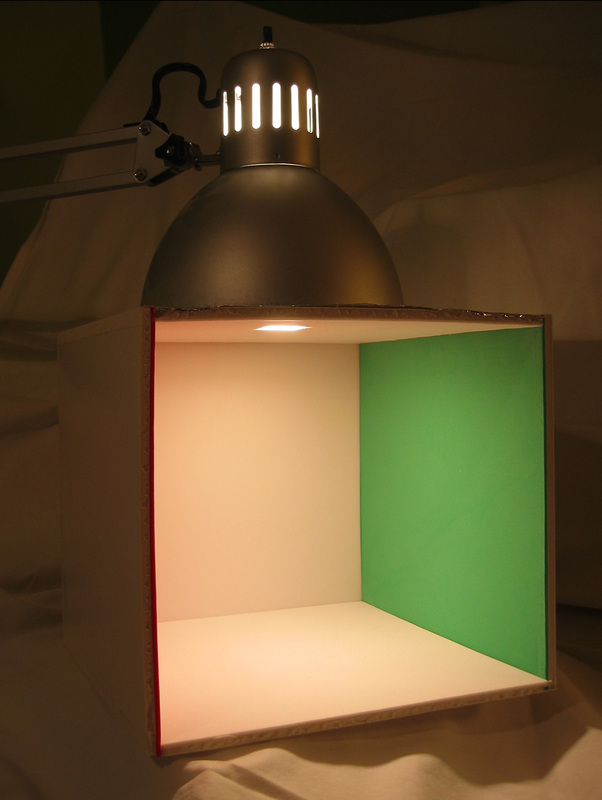 This paper focuses on the construction of a physical Cornell Box model and all lighting tests associated with it. 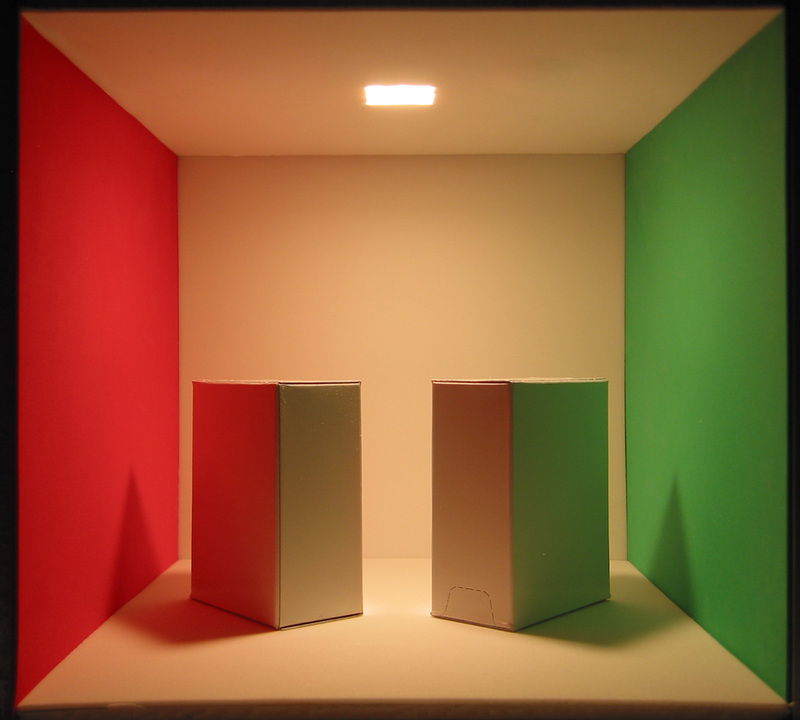 Perhaps the most comprehensive archive regarding the Cornell Box can be found online at the Cornell University Program of Computer Graphics. This fascinating site contains all relevant information pertaining to the Cornell Box ranging from it’s history, comparative studies and data specifications. It is first important to mention that while there are many versions of the Cornell Box throughout the internet, the Cornell University Program of Computer Graphics’ version probably has the most detailed one available. 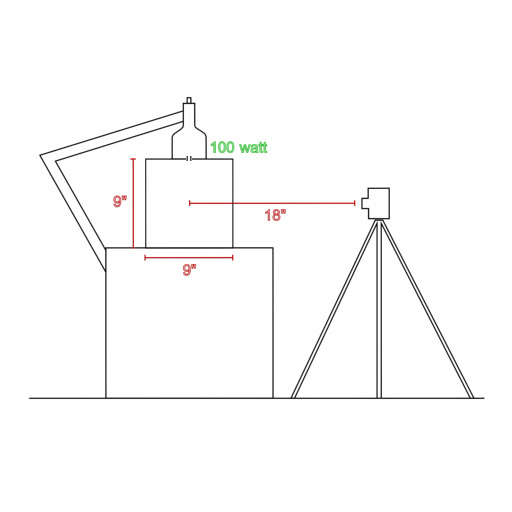 Not only do they supply object measurements, lighting and camera information, but also surface reflectance properties and much more. For this reason, it is worthwhile to reference their model as the definitive Cornell Box. 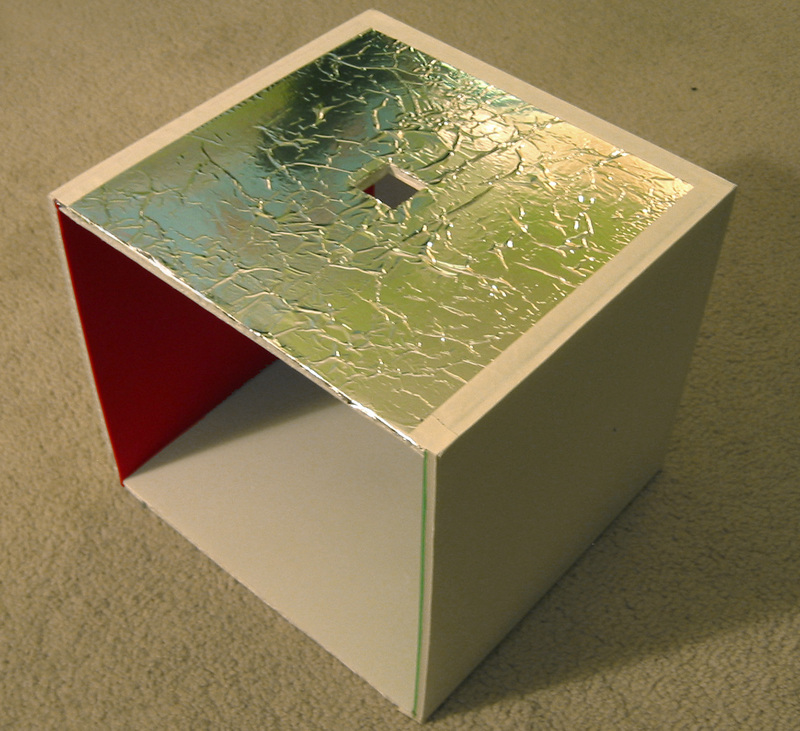 Having said that, the construction of my Cornell Box was loosely based on the Cornell University Program of Computer Graphics’ Cornell Box specifications. This means that most of the box was constructed based upon the theory of the Cornell Box rather than the specifications. This was, unfortunately, unavoidable. 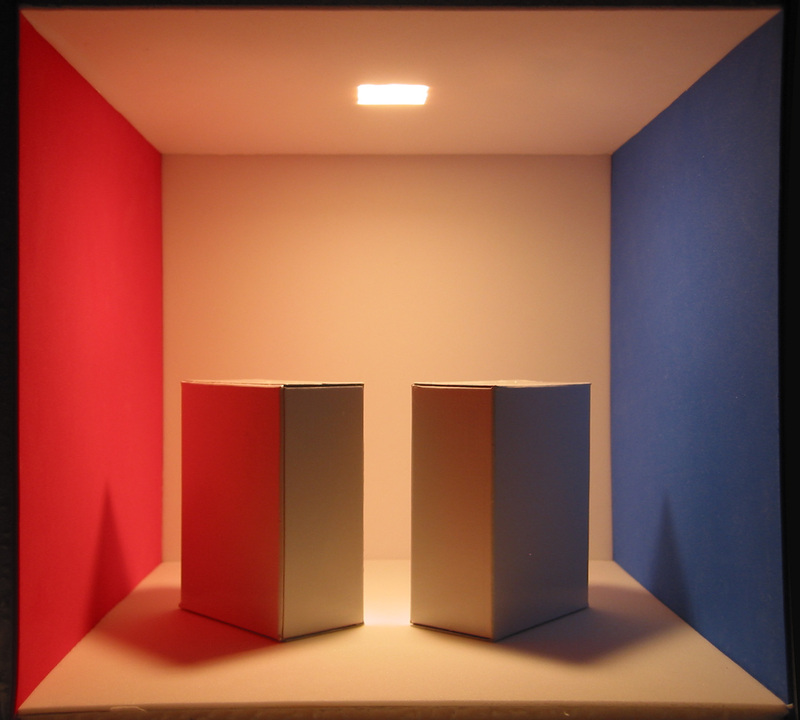 The Cornell Box has very specific width, height, depth, surface, lighting, and various other properties and specifications which must be adhered to as closely as possible in order to achieve precise lighting simulations. Since my model does not meet these exact specifications, my results have only come close and will never duplicate the real Cornell Box’s lighting conditions with total precision. The box faces were constructed out of flat white foam core, each 9 inches squared. This measurement was chosen because it was the maximum size the colored materials came in. These materials were a soft rubbery foam which seemed to be the most ideal because they were neither too absorbent nor too reflective. In addition, the texture on it was minimal and it was sturdy enough to avoid creasing/bending/scratching. Colored construction paper simply wasn’t adequate as it was far too absorbent and much too textured. Red, green and white, or red, blue and white materials were used for each face of the box. The edges of the box were taped together using specialized tape which was fairly opaque in order to not allow any light to leak in. Duct tape would have also been sufficient. The top of the box was fitted with a glued layer of tin foil which ensured that the intense lightbulb would not shine through the white foam core. Finally, a 1 inch square was cut on the top face in order to allow light to pass through. Also, in an attempt to capture as much bounced light as possible, a large white foam core card was placed in front of the camera with a hole large enough for the camera lens to fit through. The camera used was a Canon S30 which captures not only at high resolution, but also as 12-bits/channel uncompressed RAW format. This was then converted into a 16-bits/channel TIFF, and finally to a 24-bit (8-bits/channel) Targa file which was processed in Photoshop to remove the barrel distortion using my Photoshop plugin Lens Corrector PRO. 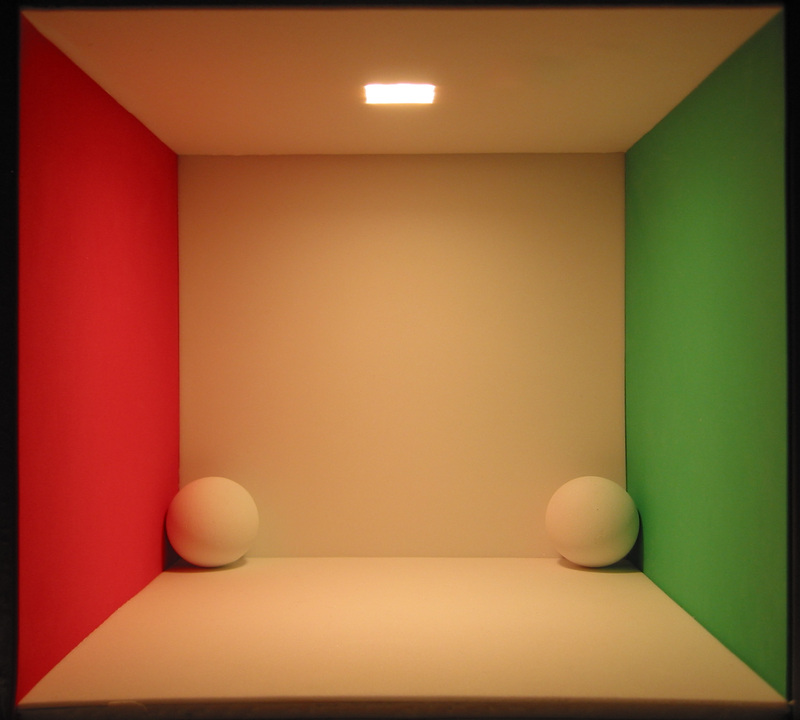 The camera was placed on a tripod 18 inches from the center of the Cornell Box, and the focal depth manually adjusted to this distance. The lamp was then fitted directly over the opening on the top face of the cube, and all other light sources turned off in order to minimize external light influences. It was shot in a darkroom. The first attempts were produced with a halogen light source since this tends to be the purest (whitest) type of lighting available, at least in contrast to conventional lights such as standard bulbs (which are warm red) and fluorescents (which are cool green). However, because Halogen lights are so concentrated and intense, the light barely distributed itself once inside the box and instead created a brightly illuminated square at the bottom face of the cube. Next, a 60 Watt standard bulb was used and although this provided fairly good light distribution throughout the box, it was quite weak. Finally, a 100 Watt bulb was used which yielded excellent results.